The southeastern corner of Becker County was opened to settlement in 1882 and became a township five years later. The few Finns, and there has even been a cooperative there, the Strawberry Lake Co-op Society. The population of all Swedish Finns living there chose to name the township Runeberg (in honor of the Finnish poet of the same name) and it has retained that name to the present time. One of its early postmasters was a Finn, Olli Karttunen. The town of Detroit Lakes, in the western part of the county, has been the home of several Finns, and during Finland's Winter War a Finnish relief committee was organized there with B. L. Benshoof as chairman. A bit to the north, in Richwood, there have been a Becker County amounted to only 308 persons in 1870. In 1900 the figure had risen to 14,375, which included 357 Finns. In 1910 the number of Finns rose to 440, in 1920 to 526. Subsequent figures reflect a gradual decline, to 426 in 1930, to 335 in 1940, and down to 191 in 1950, when the total population of the county was 24,836. 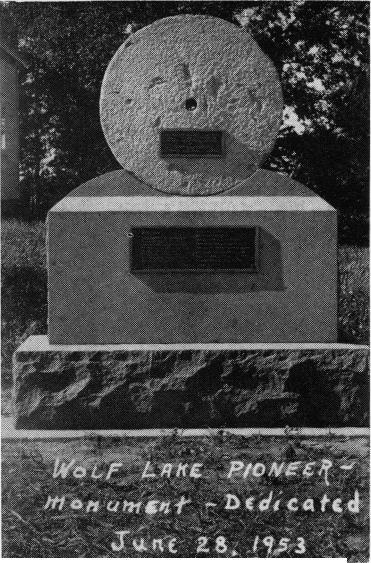 Wolf Lake Pioneer monument erected 1953.